Joan passed away on January 18, 2019 at the age of 82. She is survived by her loving husband Fred Steele, daughters Lynn Davis, Jan Forbes, stepdaughter Cindy Nelson, son Steve Forbes, stepsons Steve (Jenelle) Steele, Sean Steele, Craig (Lisa) Steele, adopted son Pat Tischart, grandchildren Trinity, Emily, Kyle (Claire), Kordell (Rebecca), Katie (Erik), Adam and Michael, numerous step grandchildren, great grandchildren Christopher, Summer, Lennon, Griffin and Kailee, brothers Conrad (Bernice) Olson and Keith (Myrna) Olson, many aunts, nieces, nephews and other family members. She was predeceased by her parents Cliff and Irma Olson, sister Freda Cooper, brother Carl Olson and daughter-in-law Katya Mycyk. Joan was born in Walpole, SK in 1936 into a musical family. She was in the family band until she moved to Regina, SK, where she met and married her first husband, with whom she had three children. In the early seventies, they moved to Kelowna where she continued to raise her three children and was a mother figure for many. In the late 1980’s, she met her second husband with whom she enjoyed living and working on the orchard for another 30 years. Joan’s career with Manpower (Federal Government) was the perfect way to continue to help nurture and guide people. She was honored to receive the Governor General’s 125th Anniversary medal. Throughout her life there was nothing more important than family; Joan was a daily part of her children’s, grandchildren’s and great grandchildren’s lives. She passed away peacefully surrounded by generations of family. The family would like to offer a sincere thank you to Dr. Sebulsky for her care over the last several years and to the staff at KGH. A special thank you to Marcia, Rebecca, Marlee and Adrian, the nurses on 2 South who helped Joan and our family through her last days. 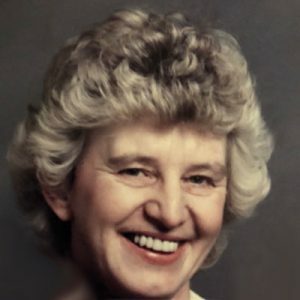 The service for FORBES, Joan Louise (nee Olson) is scheduled for A private family service will be held at a later date. . Below you will find the map for the service location and the contact information should you have any questions. A most beautiful tribute to a beautiful woman. May Joan RIP knowing she touched many lives, and will be long remembered. Sending loads of love and care to Jan, Steve, Lynn and all her family. Til we meet again. We were sad to hear of Aunt Joan’s passing and extend condolences to Fred and family. I have some great memories of summer visits to Kelowna in the 80s and will always picture Joan with a smile on her face. Our family sends our sincere sympathy to you Fred and all your family members in the loss of your wife. Cherish all of your great memories. Sincerely, Gerald Geen.